This self-empowering account gives you the option to reduce your monthly fee to $0. 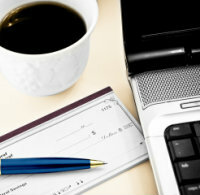 MyChoice Checking also provides unlimited checking with conveniences such as online banking and bill pay. *Once the $6.95 monthly service charge is retired, additional debit card point of sale transactions will not result in credits to the account. ATM withdrawals do not count towards qualifying debit card transactions. All transactions must be posted to the account within the Qualification Cycle. ATM-processed transactions do not count towards qualifying debit card transactions. "Monthly Qualification Cycle" means a period beginning one day prior to the first day of the current statement cycle through one day prior to the close of the current statement cycle. Transactions may take one or more banking days from the date transaction was made to post and settle to your account during monthly qualification cycle. Available for personal accounts only. Certain restrictions may apply. No fee reduction the first month.